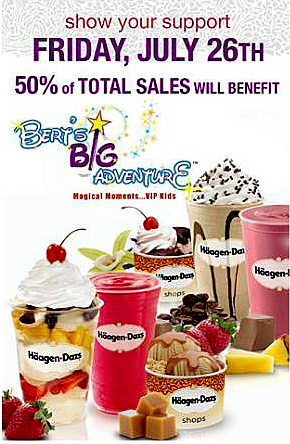 On July 26, visit Cumberland Mall and purchase a sweet treat at Haagen-Dazs and they will donate 50% of all sales to Bert’s Big Adventure! Bert’s Big Adventure is a non-profit organization designed to allow children stricken with a chronic illness and/or physically challenged between the ages of 5 to 12 who prove financial need and live in the Bert Show radio listening areas, the opportunity to experience a magical weekend at Walt Disney World as the guests of the foundation. Bert’s Big Adventure is a non-profit organization designed to allow children stricken with a chronic illness and/or physically challenged between the ages of 5 to 12 who prove financial need and live in the Bert Show radio listening areas, the opportunity to experience a magical weekend at Walt Disney World as the guests of the foundation. Each year, the foundation (known as Bert’s Big Adventure) will take these children to Walt Disney World with their parents and siblings. Because of their special needs and financial strain, this is an experience that many of these children and families would not be able to experience without the help of the foundation. The vision of the foundation is to charter a flight for these children, their families and a medical staff to Walt Disney World. While in Florida, the foundation will provide hotel accommodations, Walt Disney World park passes, transportation to and from the park, and meal coupons and spending cash for these guests of the foundation.